Johann Nepomuk Hummel was born in Pressburg (now Bratislava in western Czechoslovakia) on 14 November 1778, the son of a musician. He was a remarkable child prodigy, reading music at four, playing the violin at five and the keyboard at six. He went on to study with Mozart and at the age of ten began to tour Europe as a keyboard virtuoso in the company of his father. Comparisons with Mozart, who trod a similar path two decades earlier, were inevitable. The English amateur musician William Gardiner wrote that the youthful Hummel was ‘the most surprising performer’ that had ever visited England ‘except the young Mozart’. As an adult, however, Hummel was rather more successful than Mozart in obtaining well-paid and satisfying posts. In 1804 he succeeded Haydn as director of music in the Esterházy household; the appointment, perhaps inevitably, was not altogether successful, and he was dismissed in 1811. After a few years as a freelance composer and performer in Vienna, Hummel became Kapellmeister at the Stuttgart court in 1816, moving to Weimar in the winter of 1818/19. Here he was able to combine financial security with a good deal of freedom: he conducted the court opera, had ample time to compose and teach privately, and made a number of lucrative foreign tours. By the early 1830s his style of composing and playing began to seem old-fashioned, and his popularity waned. Nevertheless, he was still a rich and famous man when he died at Weimar on 17 October 1837. Hummel is mainly remembered today as a keyboard virtuoso, and the author of grateful but slight pieces for unusual chamber combinations – such as his Sonata in C minor for piano and mandolin, or the extraordinary ‘Septett militaire’ in C for piano, flute, violin, clarinet, trumpet, cello and double bass. In his own time, however, Hummel was taken much more seriously as a composer. He contributed prolifically to virtually all the genres of the day – opera, singspiel, ballet, church music, occasional choral music, dance music, the concerto, chamber music and, of course, piano music (three of his piano sonatas have been recorded by Stephen Hough on Hyperion CDA67390). Significantly, the one genre conspicuous by its absence in Hummel’s output is the symphony, for it was largely through his revolutionary series of symphonies that Beethoven established his reputation as a composer, and Beethoven was Hummel’s chief rival in Vienna. The two composers managed to maintain reasonably friendly relations over several decades, despite constant warfare between their friends and disciples and despite a number of unfortunate incidents. Hummel inserted several allusions to the ‘Eroica’ Symphony in his Clarinet Quartet of 1808, apparently in a satirical vein, while Beethoven supposedly had an amorous interest in Hummel’s wife Elisabeth and sometimes failed to hide his opinion of Hummel’s abilities – notably when he tore up Hummel’s four-hand arrangement of his overture to Fidelio and gave the task to Moscheles. The root of the problem, of course, was that Hummel and Beethoven were the main Viennese protagonists in the debate that developed in German-speaking countries in the early nineteenth century between conservative and progressive composers; between those who were content to develop the Classical musical language within its established forms, and those who felt that the style of Mozart and Haydn had outlived its usefulness and needed reforming root and branch. 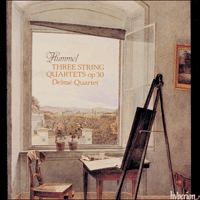 Hummel’s three Opus 30 String Quartets – his only contributions to the medium – are particularly fascinating works in this context, for they were composed in or shortly before 1804 in the wake of Beethoven’s revolutionary Opus 18 Quartets, published in 1801. The first years of the new century saw the string quartet established as the most important genre of chamber music. The Italian composer Giuseppe Maria Cambini even claimed, in an article published in the Allgemeine Musikalische Zeitung in 1804, that quartet playing was the highest form of musical life. This was the period when the medium began to be defined by its past: a ‘complete’ edition of Haydn’s Quartets, for instance, was issued by Pleyel in 1801, who followed it soon after with a ten-volume set of miniature scores, a landmark in the genre – and in the history of publishing. Hummel’s quartets certainly draw on much of the history of the Viennese string quartet. Their basic idiom is the ‘dialogue’ type of writing, half motivic, half contrapuntal, that Haydn developed in his later quartets as a means of creating true equality between the parts. In much of Op 30 No 2 or in the remarkable Andante of Op 30 No 3 Hummel seems to have been interested less in the ‘dialogue’ style than in a wholesale revival of Baroque contrapuntal techniques; a passage in the latter even seems to be alluding to ‘Comfort ye’ from Handel’s Messiah, popularized in Vienna by Mozart’s version of 1789. Counterpoint had always been important to Viennese quartet composers. Many early examples are cast in the form of a prelude and fugue; canonic minuets and fugal finales are common in quartets of the 1770s, such as Haydn’s Op 20; Mozart continued the tradition with his remarkable Adagio and Fugue of 1789, and in his quartet arrangements of Bach keyboard fugues (though their authenticity has been disputed). A set of contrapuntal quartets by Florian Gassmann (1729–1774) was published as late as 1804. Hummel made a distinctive contribution to this tradition by combining learned counterpoint with a popular style derived from Austrian folk music, as in the haunting Allemande of Op 30 No 3 (a waltz-like contredanse, not the grave duple-time dance of the Baroque period), or the Menuetto of Op 30 No 2. In the latter a severely contrapuntal minuet in G minor makes a startling contrast with the entrancing G major trio, which uses shifting combinations of pizzicato and coll’arco to evoke the sound of a village band. Hummel modifies the conventional form of the eighteenth-century minuet and trio by adding an extra repeat of the trio at the end – an inspired touch. In Op 30 Nos 2 and 3 Hummel does not venture much beyond the idiom of late Haydn, but the C major Quartet, Op 30 No 1, seems to be his response to the challenge set by Beethoven in his Op 18. Beethoven’s influence is most marked in the work’s harmonic planning. The work opens with a slow introduction in C minor rather than the expected C major, and has an Adagio in E major. Beethoven made a feature of juxtaposing movements a third apart in his Op 18, but the present case is particularly piquant because the trio of the preceding C major Menuetto is in A flat, at the opposite end of the harmonic spectrum from E major. Hummel also uses Beethovenian harmonic patterns within movements. A good example is in the exposition of the Allegro ma non troppo, which moves away from C major by a series of sudden upward modulations, into D minor and then E minor. Hummel’s melodic style is generally more relaxed and discursive than Beethoven’s, though the violent accents and displaced phrase lengths (producing the effect of 5/4 bars) of the passage just mentioned recall his great rival, as do the chromatic scales and cross accents of the scherzo-like Menuetto. The trio has no internal repeats and acts as a development section, making the movement sound more like a symphonic scherzo of the 1820s or ’30s than an eighteenth-century minuet and trio. Hummel may not have been successful in challenging Beethoven in the quartet medium – he did not return to it after Op 30 – but he certainly produced three remarkable and accomplished works that deserve a place in the modern repertory. They strongly suggest that we are wrong to think of Hummel as a composer of lightweight novelties. Johann Nepomuk Hummel est né à Presbourg (maintenant Bratislava en Tchécoslovaquie occidentale) le 14 novembre 1778, le fils d’un musicien. C’était un enfant prodige remarquable qui lisait la musique à l’âge de quatre ans, jouait du violon à cinq ans et du piano à six. On l’envoya étudier avec Mozart et à dix ans il commençait à faire des tournées en Europe en qualité de virtuose du clavier accompagné de son père. Les comparaisons avec Mozart qui avait suivi un parcours similaire deux décennies auparavant, étaient inévitables. Le musicien amateur anglais, William Gardiner, écrivit que le jeune Hummel était «l’exécutant le plus surprenant» qui soit jamais venu en Angleterre «à l’exception du jeune Mozart». Toutefois adulte, Hummel réussit mieux que Mozart à obtenir des postes bien payés et satisfaisants. En 1804 il succédait à Haydn comme directeur de musique de la maison Esterházy; une nomination qui, fatalement peut-être, ne fut pas très réussie et il était relevé de ses fonctions en 1811. Après quelques années comme compositeur et exécutant indépendant à Vienne, Hummel devint Maître de Chapelle à la cour de Stuttgart en 1816 puis à Weimar pendant l’hiver de 1818/19. Là il fut en mesure d’allier la sécurité financière et une assez grande liberté. Il dirigeait l’opéra de la cour, avait amplement le temps de composer et de donner des leçons particulières et il fit plusieurs tournées lucratives à l’étranger. Dès le début des années 1830, son style de composition et de jeu semblait démodé et sa popularité déclina. Mais il était toujours riche et célèbre lorsqu’il mourut à Weimar le 17 octobre 1837. Aujourd’hui on se souvient essentiellement de Hummel comme d’un virtuose du clavier et l’auteur de morceaux gracieux mais sans poids pour des combinaisons de chambre inhabituelles – comme par exemple sa sonate en ut mineur pour piano et mandoline ou son extraordinaire «Septuor militaire» en ut pour piano, flûte, violon, clarinette, trompette, violoncelle et contrebasse. Néanmoins à son époque, Hummel était pris beaucoup plus au sérieux en qualité de compositeur. Il contribua d’une manière prolifique à virtuellement tous les genres du jour: opéra, singspiel, ballet, musique sacrée, musique occasionnelle pour chœur, musique de danse, concerto, musique de chambre et bien sûr, musique pour piano. Il est significatif de remarquer que le seul genre qui brille par son absence dans la production de Hummel est la symphonie, car c’est en effet essentiellement sur sa série révolutionnaire de symphonies que la réputation de compositeur de Beethoven est bâtie. Beethoven était le principal rival de Hummel à Vienne. Les deux compositeurs réussirent à conserver des relations amicales pendant plusieurs décennies malgré une guerre constante entre leurs amis et disciples et malgé plusieurs incidents regrettables. Hummel inséra plusieurs allusions à la symphonie «Héroïque» dans son quatuor pour clarinette de 1808, apparemment dans une veine satirique, tandis qu’on raconte que Beethoven nourrissait un penchant amoureux pour Elisabeth, la femme de Hummel, et ne parvenait parfois pas à dissimuler ce qu’il pensait du talent de Hummel – notamment lorsqu’il déchira l’arrangement pour quatre mains de Hummel, de son ouverture pour Fidelio et chargea Moscheles de la tâche. À l’origine du problème il y avait bien sûr le fait que Hummel et Beethoven étaient les principaux protagonistes viennois dans le débat qui prenait naissance dans les pays de langue allemande au début du dix-neuvième siècle entre les compositeurs à tendance conservatrice et à tendance progressiste; entre ceux qui se contentaient de développer le langage musical classique dans ses formes établies et ceux qui avaient l’impression que le style de Mozart et de Haydn avait fait son temps et avait besoin de racines et de ramifications réformatrices. Les trois quators pour instruments à cordes, Opus 30, de Hummel – sa seule contribution à ce genre de musique – sont des œuvres particulièrement fascinantes dans ce contexte car ils furent composés en 1804 ou peu avant cette date dans le sillage des quatuors, Opus 18, révolutionnaires de Beethoven publiés en 1801. Les premières années de ce siècle nouveau virent l’établissement du quatuor pour instruments à cordes comme le genre le plus important de la musique de chambre. Le compositeur italien, Giuseppe Maria Cambini a même prétendu, dans un article publié dans le Allgemeine Musikalische Zeitung en 1804, que jouer des quatuors était la plus haute forme de la vie musicale. C’était l’époque à laquelle ce genre de musique commençait à être défini par son passé; en 1801 par exemple, Pleyel publiait une édition complète des quatuors de Haydn, suivie peu de temps après par une collection en dix volumes de partitions miniatures, un jalon dans le genre tout comme dans l’histoire de l’édition. Les quatuors de Hummel s’inspirent certainement beaucoup de l’histoire du quatuor viennois pour instruments à cordes. L’expression fondamentale de ces quatuors est le dialogue dans le style à moitié à motif, à moitié contrapuntique développé par Haydn dans ses derniers quatuors pour essayer de créer une égalité vraie entre les parties. Dans une part importante de l’Opus 30 no2 ou dans le remarquable Andante de l’Opus 30 no3, Hummel semble s’être moins intéressé au style du dialogue qu’à la reprise en masse des techniques contrapuntiques baroques; un passage de ce dernier morceau semble même faire allusion à «Comfort ye» du Messie de Hændel, rendu populaire à Vienne grâce à la version de Mozart de 1789. Le contrepoint avait toujours été important pour les compositeurs de quatuors viennois. De nombreux exemples précoces sont travaillés en forme de prélude et de fugue; les menuets en canon et les finales fuguées sont communs dans les quatuors des années 1770, comme par exemple l’Opus 20 de Haydn. Mozart continua la tradition avec son remarquable Adagio et Fugue de 1789 et dans ses arrangements pour quatuor des fugues pour clavier de Bach (bien que leur authenticité ait été contestée). Une série de quatuors contrapuntiques par Florian Gassmann (1729–1774) fut publiée aussi tard qu’en 1804. Hummel contribua à la tradition de manière distincte en combinant le contrepoint savant avec un style populaire tiré de la musique populaire autrichienne, comme dans l’Allemande obsédante de l’Opus 30 no3 (une contredanse sur un rythme de valse et non plus la grave danse à deux temps de l’époque baroque), ou encore le menuet de l’Opus 30 no2. Dans ce dernier morceau le menuet excessivement contrapuntique en sol mineur fait un contraste saisissant avec le trio enchanteur qui utilise des combinaisons changeantes de pizzicato et de coll’arco pour évoquer le son d’un orchestre de village. Hummel modifie la forme conventionnelle du menuet et du trio du dix-huitième siècle en ajoutant une reprise supplémentaire du trio à la fin – une touche inspirée. Dans l’Opus 30 nos2 et 3, Hummel ne s’aventure guère au-delà de l’idiome de feu Haydn, mais le quatuor en ut majeur Opus 30 no1, semble être sa réplique au défi lancé par Beethoven dans son Opus 18. L’influence de Beethoven est surtout marquée dans le plan harmonique de l’œuvre. Le morceau s’ouvre avec une introduction lente en ut mineur et non pas en ut majeur comme on s’y attendrait, et a un Adagio en mi majeur. Beethoven utilisa beaucoup la juxtaposition des mouvements écartés d’une tierce dans son Opus 18, mais le cas présent est particulièrement piquant car le trio du menuet précédent en ut majeur est en la bémol, soit à l’extrémité opposée du spectre harmonique à partir du mi majeur. Hummel utilise aussi des modèles harmoniques beethoviens dans les mouvements. L’exposition de l’Allegro ma non troppo qui s’éloigne du ut majeur par une série de modulations ascendantes soudaines, en ré mineur puis en mi mineur, en est un bon exemple. Le style mélodique de Hummel est en général plus détendu et plus décousu que celui de Beethoven bien que les accents violents et les longueurs de phrase déplacées (produisant l’effet de 5/4 barres) du passage que je viens de mentionner, rappellent cette grande reprise tout comme les gammes chromatiques et les accents déplacés du menuet qui épouse la mesure du scherzo. Le trio n’a pas de reprises internes et sert de section de développement donnant ainsi au mouvement plus le son d’un scherzo symphonique des années 1820 ou 30, que celui d’un menuet et trio du dix-huitième siècle. Hummel n’a peut-être pas réussi à faire concurrence à Beethoven dans le genre du quatuor – genre qu’il ne reprit d’ailleurs pas après l’Opus 30 – mais il composa certainement trois œuvres remarquables et accomplies qui méritent une place dans le répertoire moderne. Elles insinuent fortement que nous avons tort de penser que Hummel est un compositeur d’œuvres fantaisistes légères. Johann Nepomuk Hummel wurde am 14. November 1778 in Preßburg (heute Bratislawa im Westen der Tschechoslowakei) als Musikersohn geboren. Er galt als ein bemerkenswertes Wunderkind, denn mit vier Jahren konnte er Noten lesen, er spielte die Geige mit fünf und das Klavier im Alter von sechs Jahren. Eine Zeitlang lernte er zusammen mit Mozart und als er zehn Jahre alt war, begab er sich in Begleitung seines Vaters auf eine Europatournee als Klaviervirtuoso. Natürlich waren Vergleiche mit dem jungen Mozart, der zwanzig Jahre früher einen ähnlichen Weg eingeschlagen hatte, unvermeidlich. Der englische Laienmusiker William Gardiner schrieb, der junge Hummel sei „der erstaunlichste Künstler“, der jemals England besucht hat „mit Ausnahme des jungen Mozarts“. Als Erwachsener war Hummel jedoch erfolgreicher als Mozart, gutbezahlte und befriedigende Arbeit zu erhalten. 1804 übernahm er von Haydn das Kapellmeisteramt im fürstlichen Haushalt der Esterházys; allerdings war diese Anstellung nicht so erfolgreich, denn 1811 wurde er entlassen. Nach ein paar Jahren als freiberuflicher Komponist und Musiker in Wien wurde Hummel 1816 Kapellmeister am Hof zu Stuttgart und im Winter 1818/19 zog er dann nach Weimar. Hier konnte er sich finanzielle Sicherheit verbunden mit ziemlich viel Freiheit verschaffen – er dirigierte die Hofoper, hatte genug Zeit, zu komponieren und Privatunterricht zu geben, und unternahm eine Reihe von einträglichen Auslandstourneen. Von 1830 an wurde sein Komponier- und Spielstil jedoch als altmodisch angesehen und seine Beliebtheit nahm ab. Aber als er am 17. Oktober 1837 in Weimar starb, war er immer noch ein reicher und berühmter Mann. Heute denkt man an Hummel als einen Klaviervirtuosen und Urheber angenehmer, jedoch leichter Stücke für ungewöhnliche Kammerkombinationen wie beispielsweise seine Sonate in c-Moll für Klavier und Mandoline oder das merkwürdige „Septett militaire“ in C-Dur für Klavier, Flöte, Geige, Klarinette, Trompete, Cello und Kontrabaß. Dagegen schenkte man dem Komponisten Hummel zu seinen Lebenszeiten sehr hohe Achtung. Er trug in großem Maße zu fast allen Genres der Zeit bei: Oper, Singspiel, Ballett, Kirchenmusik, Gelegenheitschormusik, Tanzmusik, Concerto, Kammermusik und natürlich Klaviermusik. Bezeichnenderweise fehlt in Hummels Werk die Sinfonie, denn waren es nicht die bahnbrechenden Sinfonien, durch die Beethoven als Komponist bekannt wurde? Tatsächlich war Beethoven in Wien Hummels größter Rivale. Die beiden Komponisten konnten jedoch über mehrere Jahrzehnte einigermaßen freundliche Beziehungen unterhalten, trotz der ständigen Streitereien zwischen ihren Freunden und Anhängern und trotz einer Reihe unglückseliger Ereignisse. Hummel fügte seinem Klarinetten-Quartett von 1808 einige indirekte Bezugnahmen auf die „Eroica“ hinzu, scheinbar in einem satirische Ton, und Beethoven hatte angeblich ein amouröses Interesse an Hummels Ehefrau Elisabeth und konnte gelegentlich seine Meinung von Hummels Fähigkeiten nicht im Zaume halten – beispielsweise, als er Hummels vierhändige Bearbeitung seiner Ouvertüre zu Fidelio in tausend Stücke zerriß und sie an Moscheles weitergab. Die Ursache des Problems war natürlich, daß Hummel und Beethoven in Wien Hauptpersonen in der Debatte waren, die sich Anfang des neunzehnten Jahrhunderts in den deutschsprachigen Ländern zwischen konservativen und progressiven Komponisten entwickelte – zwischen denen, die sich mit der Weiterentwicklung der klassischen Musiksprache mit ihren festgelegten Formen zufrieden gaben, und denen, die der Meinung waren, der Stil Mozarts und Haydns hätte ausgedient und müßte von Grund auf reformiert werden. Hummels drei Streichquartette, Opus 30 – sein einziger Beitrag zu diesem Medium – faszinieren in diesem Zusammenhang besonders, da sie um 1804 als Folge von Beethovens revolutionären Quartetten des Opus 18 entstanden, die 1801 veröffentlicht wurden. In den ersten Jahren des neuen Jahrhunderts wurde deutlich, wie sich das Streichquartett als das wichtigste Genre der Kammermusik etablierte. Der italienische Komponist Giuseppe Maria Cambini behauptete in einem Artikel in der Allgemeinen Musikalischen Zeitung von 1804 sogar, daß das Spielen im Quartett die höchste Form des musikalischen Lebens sei. Zu dieser Zeit war es auch, daß man anfing, dieses Medium nach seiner Vergangenheit zu definieren: beispielsweise gab Pleyel im Jahre 1801 eine „komplette“ Ausgabe der Haydn-Quartette heraus, die er kurz darauf durch eine zehnbändige Sammlung von Miniaturpartituren ergänzte – ein Kennzeichen sowohl für das Genre als auch für die Geschichte der Veröffentlichung von Musikalien. Hummels Quartette beziehen sich zweifellos stark auf die Geschichte des Wiener Streichquartetts. Grundbestandteil ist die Art des Schreibens im „Dialog“, halb motivistisch, halb kontrapunktisch, das Haydn bei seinen späteren Quartetten als ein Mittel entwickelte, zwischen den einzelnen Teilen ein wahres Gleichgewicht zu schaffen. Bei einem Großteil von Opus 30 Nr. 2 oder in dem bemerkenswerten Andante des Opus 30 Nr. 3 scheint Hummel weniger am „Dialogstil“ als an einem vollständigen Wiederaufgreifen der barocken Kontrapunkttechnik interessiert gewesen zu sein; eine Passage im Andante weist auf einen Bezug auf „Comfort ye“ aus Händels Messias hin, das in Wien durch Mozarts Version von 1789 bekannt wurde. Der Kontrapunkt hatte schon immer eine besondere Bedeutung für die wiener Quartettkomponisten. Viele frühe Beispiele sind in der Form von Präludium und Fuge gegossen; Menuettkanons und Fugenfinale sind häufig in den Quartetten um 1770 anzutreffen, beispielsweise Haydns Opus 20. Mozart setzte diese Tradition mit seinem bemerkenswerten Adagio und Fuge von 1789 und seinen Quartettversionen von Bachs Klavierfugen fort (die Glaubwürdigkeit der letzteren ist allerdings strittig). Ein Satz kontrapunktischer Quartette von Florian Gassmann (1729–1774) wurde erst 1804 herausgegeben. Hummel leistete einen bedeutenden Beitrag zu dieser Tradition, indem er den studierten Kontrapunkt mit einem volkstümlichen Stil verband, der sich an die Volksmusik Österreichs anlehnte. Beispiele dafür sind das unvergeßliche Allemande von Opus 30 Nr. 3 (ein walzerartiger Contredanse und nicht der ernste Tanz im Zweiertakt der Barockzeit) oder das Menuett von Opus 30 Nr. 2. Im letzteren bildet ein schwer kontrapunktisches Menuett in g-Moll einen überraschenden Gegensatz zum bezaubernden Trio, das mit sich verschiebenden Kombinationen von pizzicato und coll’arco den Klang einer Dorfkapelle herbeiruft. Hummel verändert die konventionelle Menuett- und Trioform des achtzehnten Jahrhunderts, indem er am Ende des Trios eine zusätzliche Wiederholung hinzufügt – eine glänzende Idee. Mit Opus 30 Nrn. 2 und 3 wagt sich Hummel nicht sehr weit über die Ausdrucksweise des verstorbenen Haydns hinaus, jedoch scheint er mit seinem C-Dur-Quartett, Opus 30 Nr. 1 auf die Herausforderung zu reagieren, die ihm Beethoven mit seinem Opus 18 gestellt hatte. Beethovens Einfluß macht sich am deutlichsten in der Harmonieplanung des Werkes bemerkbar. Es eröffnet mit einer langsamen Einführung in c-Moll und nicht, wie zu erwarten wäre, in C-Dur, und besitzt ein Adagio in E-Dur. Beethoven machte die Gegenüberstellung der Sätze in Terzabständen ein Merkmal seines Opus 18, dem vorliegenden Fall wird jedoch besondere Würze verliehen, weil das Trio des vorhergehenden C-Dur-Menuetts in As, am gegenüberliegenden Ende des Harmoniespektrums von E-Dur angelegt ist. Auch verwendet Hummel die Harmoniemuster Beethovens innerhalb von einzelnen Sätzen. Ein gutes Beispiel dafür ist in der Exposition des Allegro ma non troppo zu finden, das sich durch eine Reihe von plötzlichen Aufwärtsmodulationen, von d-Moll und dann e-Moll, von C-Dur wegbewegt. Hummels melodischer Stil ist im allgemeinen ruhiger und weitschweifiger als Beethovens, allerdings erinnern die wilden Akzente und versetzten Phrasenlängen (wodurch die Wirkung von 5/4-Takten erzielt wird) der eben genannten Passage wie auch die chromatischen Tonleitern und versetzen Akzente des scherzo-artigen Menuettos an seinen großen Rivalen. Das Trio besitzt keine eigenen Wiederholungen und agiert als ein Entwicklungsabschnitt, wodurch der Satz eher wie ein sinfonisches Scherzo der zwanziger und dreißiger Jahre des neunzehnten Jahrhunderts als ein Menuett und Trio des achtzehnten Jahrhunderts erscheint. Hummel mag vielleicht im Wettkampf des Quartettmediums nicht so erfolgreich wie Beethoven gewesen sein – nach dem Opus 30 kehrte er nicht mehr zu diesem zurück – aber es ist sicher, daß er drei bemerkenswerte und ausgezeichnete Werke schuf, die einen Platz im modernen Repertoire verdienen. Diese Werke beweisen, daß wir Johann Nepomuk Hummel nicht als Komponist leichter Etüden abtun sollten.